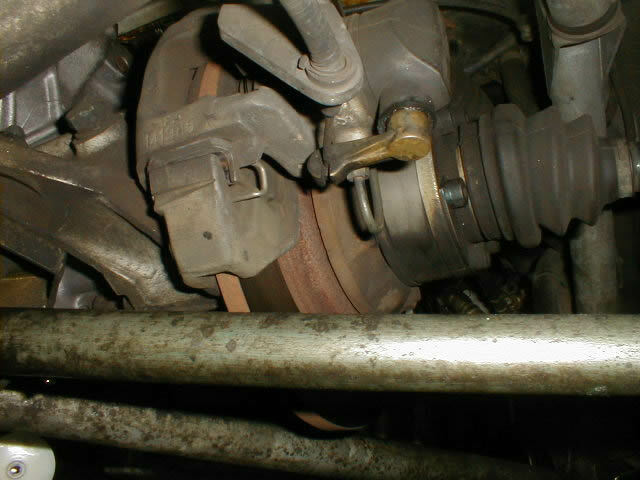 Eventually you will need to remove and replace the rear brake rotors on your Esprit. Lotus Service Notes only mention the procedure in passing. match my front set of rotors that I installed last autumn. placed under the rear jacking reinforcements on the body sills. Be safe! these while the axles are out. the same as it was, although the shop manual doesn't mandate it.) I was using an allen wrench so I had to apply more breaking torque by putting a pipe on the end of the wrench for more leverage. 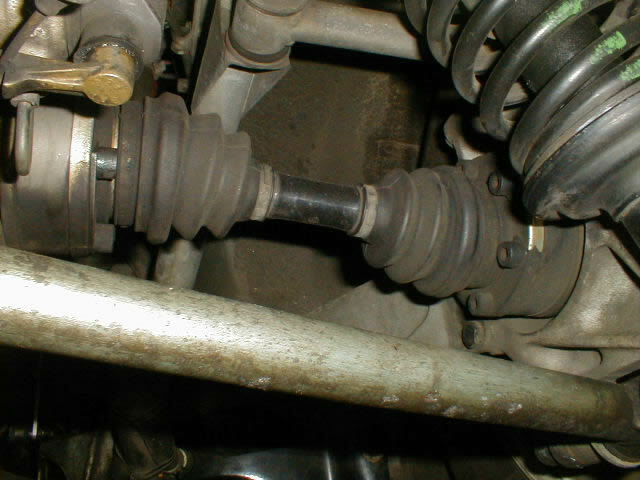 Some of the capscrews could only be turned a flat at a time due to the position of the suspension. This was the most tedious part of the procedure. 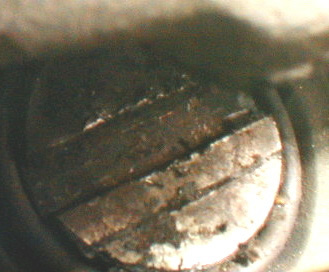 Luckily only the inboard set of screws, nearest the brake rotors, need to be removed. 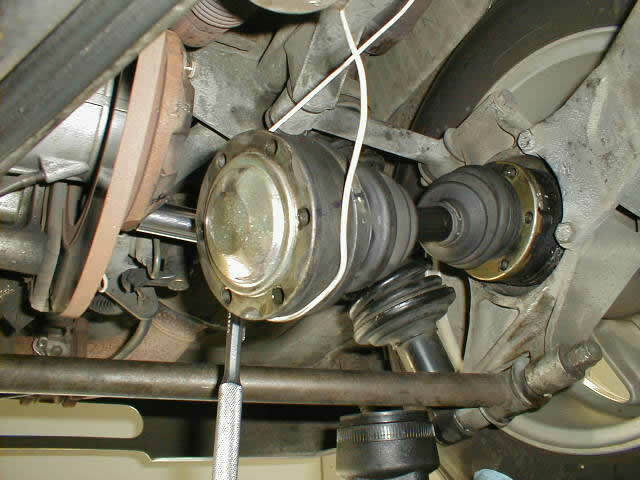 Once the axle was free it was wired to the trailing arm to keep it out of the way during the rest of the procedure. breaking the nuts free. Don't remove the nuts at this time.
) Hang the calipers out of harms way with a length of coat hangers. Don't put stress on the rubber brake line! cap on the brake master makes it a bit easier for the fluid to return to the reservoir. position to be at the top. Then remove the old rotor. here. Make sure you orient the slot properly according to the instructions in the Service Notes. is missing, the job is a lot easier. Once loosely in position the caliper can be mounted next. 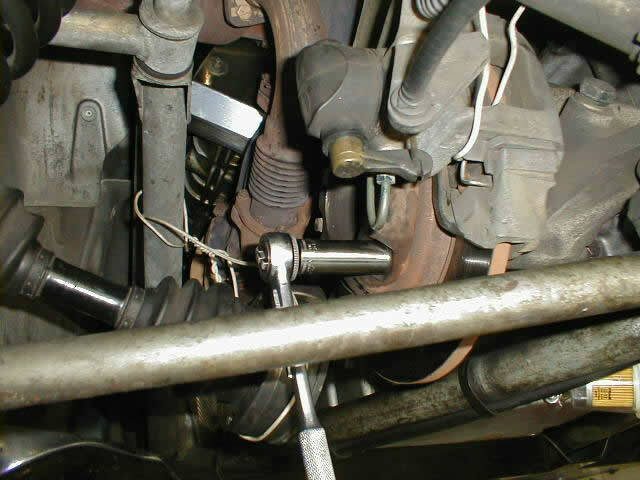 Now you will know if you retracted the caliper enough. The loose rotor allows you to angle the loaded calipers into position to slip over the rotors. on the rotors, as you don't want to warp them! make sure it was still tight. The other side rotor is nearly the same as the first. Some of the approach angles for the tools were different, but it wasn't any harder.